Correction Tape Roller (Pack of 10) WX01593 Pack of 10 Economical tape roller. Correct mistakes with white tape. Write on instantly after use. Ergonomic dispenser shape. Pack of 10 dispensers. Pentel Micro Correct Fine Point Correction Pen XZL31-W Pack of 1 Pentel Micro Correction Pen XZL31W. 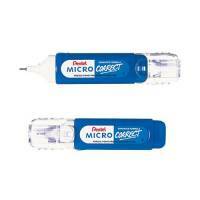 Micro fine correction pen produces dense quick drying fluid suitable for all paper types. The self-sealing tip prevents the fluid from drying out and eliminates spillages. Trichloroethane free. Pentel Micro Correct Fine Point Correction Pen Pack of 12 ZL31-W Pack of 12 Micro fine point correction pen with dense quick drying White fluid. Self sealing tip prevents drying out and spillage. For use on all paper types. Trichloroethane free. Pack 12. Pritt Compact Correction Roller 4.2mm x 10m Pack of 10 2120452 Pack of 10 Pritt Compact correction Roller. Applies dry so can be instantly written or typed over. Suitable for use on most types of paper including fax paper. Wide - 4.2mm. Pritt ECOmfort Correction Roller 4.2mm x 8.5m Pack of 10 2120632 Pack of 10 Pritt ECOmfort Correction Roller. W4.2mm x L8.5m. Tipp-Ex Exact Liner Correction Tape 810473 Pack of 1 Tippex Exact Liner 810473. Correction tape pen with pen clip for handy top pocket storage. White tape. 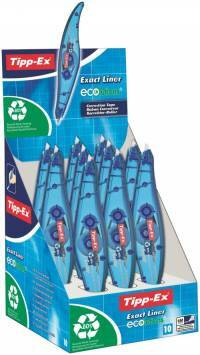 Tipp-Ex Exact Liner Correction Tape (Pack of 10) 810475 Pack of 10 Tippex Exact Liner 810475. 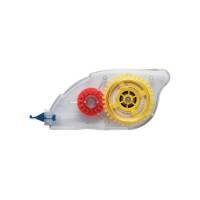 Correction tape pen with pen clip for handy top pocket storage. White tape. Tipp-Ex Micro Tape Twist Correction Tape (Pack of 10) 8706142 Pack of 10 Tipp-Ex Micro twist correction tape is compact and handy and gives instant correction for quicker re-write. 5mm x 8m. Tipp-Ex Pocket Mouse Correction Tape (Pack of 10) 820789 Pack of 1 Tipp-Ex Pocket Mouse Corrector. Brilliant disposable dry tape for instant corrections. 100 percent solvent free. Ideal for school home or office. Tape is 4.2mm wide and 10m long. Pack of 10. 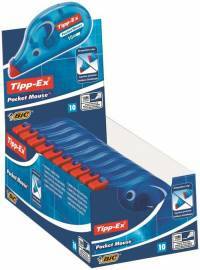 Tipp-Ex Pocket Mouse Correction Tape Blister (Pack of 10) 820790 Pack of 10 "Tippex Pocket Mouse Corrector. Brilliant disposable dry tape for instant corrections. 100% solvent free, ideal for school, home or office. Tape is 4.2mm wide and 9m long." Tipp-Ex Easy Correct Correction Tape Pack of 10 829035 Pack of 10 Tipp-Ex side action correction tape. Odour free. Tipp-Ex Correction Tape offers instant correction and instant rewriting. 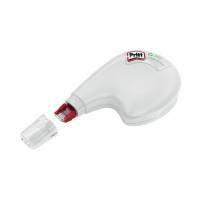 Conveniently shaped side dispenser for extra comfortable correction and extra precision. Tape size - 4.2mm x 12m. 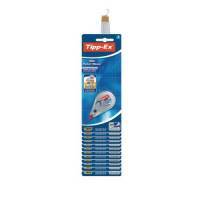 Tipp-Ex White Rapid Correction Fluid 20ml 8012879 Pack of 1 Tippex Rapid Fluid. Fast drying fluid creates an even surface which allows you to rewrite easily while the new and unique wedge-shaped foam applicator allows precise and broad correction. 20ml bottle. 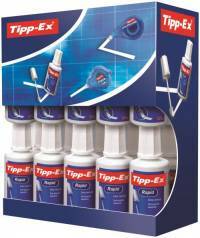 Tipp-Ex White Rapid Correction Fluid 20ml (Pack of 10) 885992 Pack of 10 Tipp-ex Rapid Fluid. Fast drying fluid creates an even surface allowing you to rewrite easily, while the new and unique wedge-shaped foam applicator allows precise and broad correction. 20ml bottle. Tipp-Ex Mini Pocket Mouse Correction Tape Pack of 10 812878 Pack of 10 Tipp-Ex mini pocket mouse. Dry correction roller covers up mistakes quickly and effectively. 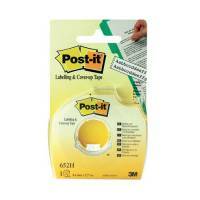 Easy to use - simply roll cassette over your mistake to leave a covering of smooth opaque film. Tape can be written on immediately. 5mm x 6m. Tipp-Ex White Shake n Squeeze Correction Pen 8ml (Pack of 10) 802422 Pack of 10 Tipp-Ex Shake and Squeeze Correction Pen. The trusted performance of Tipp-ex correction fluid with the added advantage of a pen format tip and a squeezable body to control the flow of fluid. 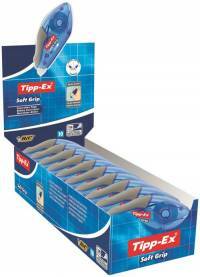 Tipp-Ex Soft Grip Correction Tape 10m Pack of 10 895933 Pack of 10 Tipp-Ex Soft Grip Correction Roller. Quick and clean application. No drying time. Instant rewriting after application. Transparent body to monitor tape supply. Rewinding system. Tear resistant polyester film. 10m of tape. 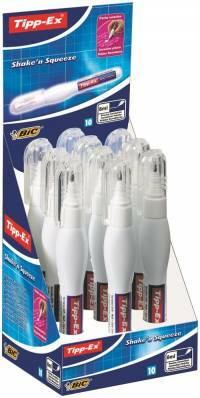 Tipp-Ex Rapid Correction Fluid (Pack of 15+5) 895950 Pack of 1 Tippex correction fluid value pack. Easy to apply fluid with unique wedge shaped foam applicator for precise and broad correction. Fast drying fluid creates an even surface for writing on. 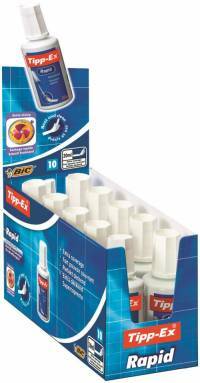 Tipp-Ex Easy Refill Correction Roller Pack of 10 8794243 Pack of 10 Tipp-Ex Easy Refill Correction Roller. Easy to refill. Dries instantly. 5mm x 14m. Pack of 10. 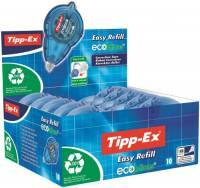 Tipp-Ex Easy Refills For Correction Roller Pack of 10 879435 Pack of 10 Tipp-Ex Easy Refills for Correction Roller. Easy to refill. Dries instantly. 5mm x 14m. Pack of 10. Tipp-Ex Easy Correct Tape Value Pack of 20 895951 Pack of 1 Tipp-Ex side action correction tape. Odour free. 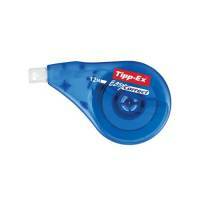 Tipp-Ex Correction Tape offers instant correction and instant rewriting. Conveniently shaped side dispenser for extra comfortable correction and extra precision. Tape size - 4.2mm x 12m.